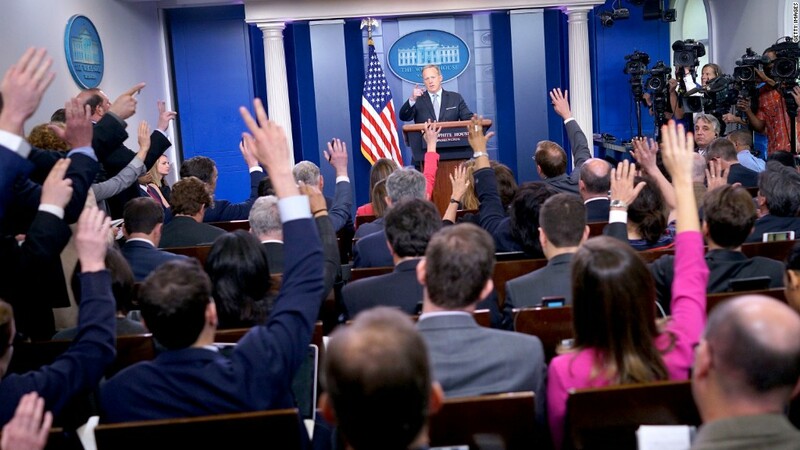 Are WH briefings now a waste of time? The White House is in silent mode. President Trump's press secretary Sarah Huckabee Sanders isn't holding a press briefing on Monday, even though Trump is officially back at work after a 17-day vacation. Sanders and other White House aides are nowhere to be found on television. Trump himself has barely spoken in public since he was widely criticized for his comments at an impromptu press conference last Tuesday. That will change on Monday night when Trump delivers a prime time address -- the first one of his presidency -- about the war in Afghanistan. The next night he'll hold a rally in Arizona. But reporters who cover the White House say they are struck by the relative silence from the press shop. "This is a tough moment for this White House," the Associated Press' Jonathan Lemire said on CNN's "Reliable Sources." So White House officials are laying low -- avoiding questions about Trump's "very fine people" comments, criticism of Trump by Republican party leaders, the collapse of his business councils, cancellations at his Mar-a-Lago club, and other controversies. No matter who's president, Sunday political talk shows usually try to book spokespeople, cabinet members or other senior officials for interviews. But no Trump aides agreed to appear on any of the Sunday shows. "The White House was unable, or perhaps unwilling, to provide a guest, right down to the White House press secretary," Chuck Todd said on "Meet the Press." He noted that members of the GOP leadership in Congress also declined to come on. Trump representatives have even been absent from Fox News Channel's pro-Trump opinion shows. ABC anchor Martha Raddatz, who moderated "This Week" on Sunday, said that when her team tried to book a White House guest, "they pointed us" to Liberty University president Jerry Falwell Jr. instead. Falwell isn't a government official, but he served as a Trump booster in an interview with Raddatz. He also appeared on "Fox & Friends" on Monday morning, causing the president to tweet, "Jerry Falwell of Liberty University was fantastic on @foxandfriends. The Fake News should listen to what he had to say. Thanks Jerry!" Trump's Twitter account has remained active since last Tuesday's stunning Q&A session, but the President has only spoken to the press corps one time since then, despite his Twitter assertion that he was "working hard" at his golf resort in Bedminster, New Jersey. While Trump was flying home from Bedminster, the Navy announced that the destroyer USS John S. McCain had been involved in a collision with a merchant ship east of Singapore. The initial reports were worrisome, so some of the reporters covering Trump's arrival at the White House shouted questions to him about the collision. The President's only response picked up by the microphones was "that's too bad." Trump's comment came around 8:30 p.m. ET. Half an hour later, the Navy announced that ten sailors were missing and five others were injured. Trump's "too bad" comment earned him even more criticism. Some reporters wondered whether he was adequately briefed about the collision, and if not, why not. At 11 p.m. the president tweeted, "Thoughts & prayers are w/ our @USNavy sailors aboard the #USSJohnSMcCain where search & rescue efforts are underway." Sanders posted a similar comment. Sanders' last on-camera press briefing was on August 2. It was memorable because Trump senior policy advisor Stephen Miller sparred with CNN's Jim Acosta and other reporters. There were two on-camera briefings by other officials during the President's vacation in New Jersey. The White House may have decided not to schedule a press briefing on Monday so that the president's prime time address would dominate the day. But the decision further creates a sense that Trump aides are trying to stay quiet. Vice President Mike Pence, on the other hand, repeatedly fielded questions from reporters and gave interviews while traveling in South America last week. And Secretary of Defense James Mattis spoke with reporters while flying to meetings in Jordan on Sunday. Trump's own communications strategy (if it can be called that) has been disjointed. For two days in Bedminster, preceding the violence in Charlottesville, he seemed eager to talk with the White House press corps. "He hadn't answered a question from the media in ages," Lemire said. But then he fielded 50-plus questions, "making eye contacts with reporters, saying, 'Come on, bring me another, bring another one.'" "Then, Charlottesville happened" on August 12, Lemire said. After delivering conflicting statements on Saturday and Monday, Trump surprised his aides by answering questions in the lobby of Trump Tower on Tuesday. Lemire recalled seeing Sanders "wildly looking around the room, trying to make eye contact with people." He said "she was trying to figure out like is this something that we could try to rein in? Should we stop this? What should we do now?" Nearly one week later, those questions are still operable.